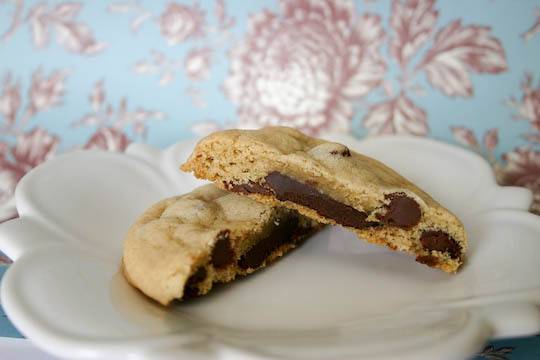 Homepage / candy / Chocolate Stuffed Chocolate Chip Cookies. 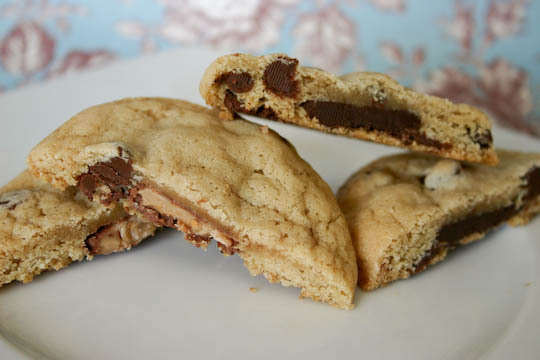 Chocolate Stuffed Chocolate Chip Cookies. 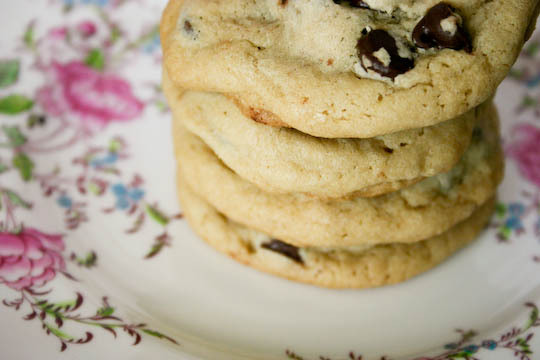 I love chocolate chip cookies. Can you tell? This being my third post about them this week and all. I’m sorry. You love me. If it helps, I promise to post something so different in the next few days that you’ll wonder if it’s the same blog. 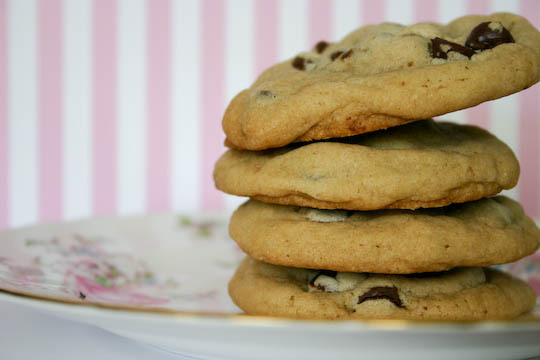 chocolate chip cookies is the possibilies. You can bake them onto graham crackers like s’mores. You can stuff them with Oreos. You can mix and match them with other cookie doughs to make them pretty and marbled. You can fancy them up with oats and M&Ms and pecans or make mini frosting-stuffed cookie sandwiches. 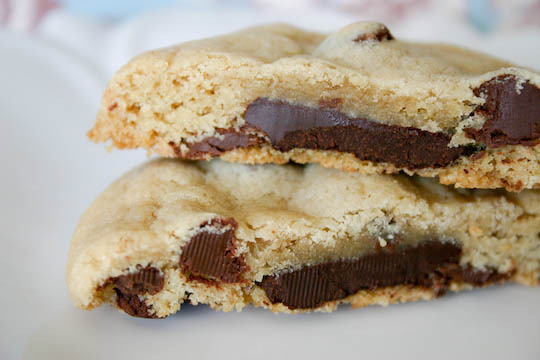 Or… you can stuff them with even more chocolate. … and mini Heath toffee bars. You know. Cuz that’s just so much easier to resist than a peanut butter cup. Speaking of Kit Kats… did you know there are other flavors besides chocolate? Like blueberry, baked corn, sweet potato, and apple? I know. My mind was blown too. but were full of secret awesome on the inside. 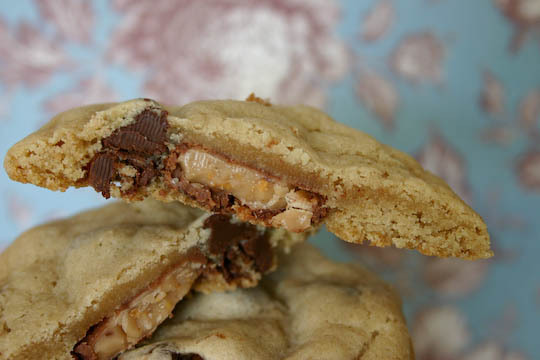 They’d be the perfect cookies to make to use up any leftover Halloween candy. You know. If it was October and not the beginning of spring. In a separate bowl, mix the flour, salt, and baking soda. Slowly add to wet ingredients until just combined. Stir in chocolate chips. 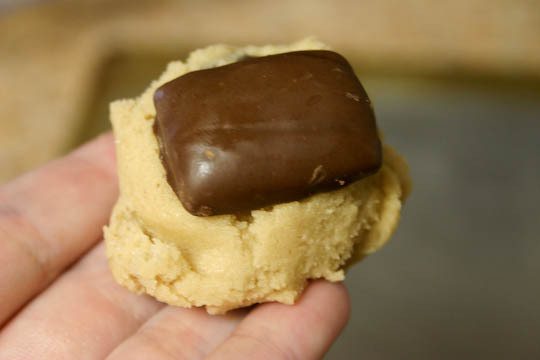 Using a cookie scoop, take one scoop of dough and place on top of a mini chocolate bar. Take another scoop of dough and place on bottom of chocolate bar. 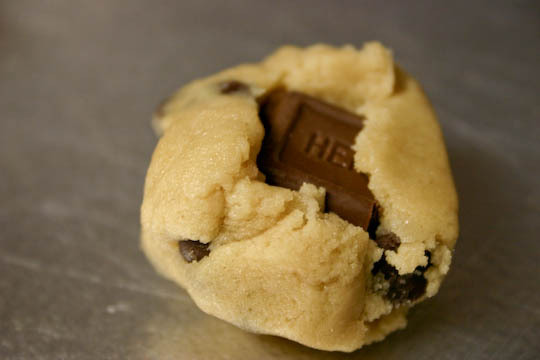 Seal edges together by pressing and cupping in hand until candy is completely enclosed with dough. Place onto a parchment lined or greased baking sheet and bake cookies for 9-13 minutes or until cookies are baked to your liking. Let cool for 5 minutes before transferring to a wire rack. 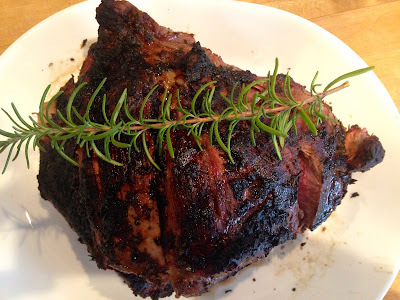 Previous post Food That Should Exist. Next post Oreo Stuffed Chocolate Chip Cookies.